MLS#: 1683628 - Courtesy of Brokers Guild-Cherry Creek Ltd.
Colorado Mountain Living at its Best One of a Kind!!! 36+ Acre Mountain Ranch, Great location, Very private,park like setting, southern exposure, flat usable land, A-2 zoning, seasonal pond, only minutes from Conifer and Denver, Two stall pole barn, tack room and storage for hay. This is a turn key horse property. 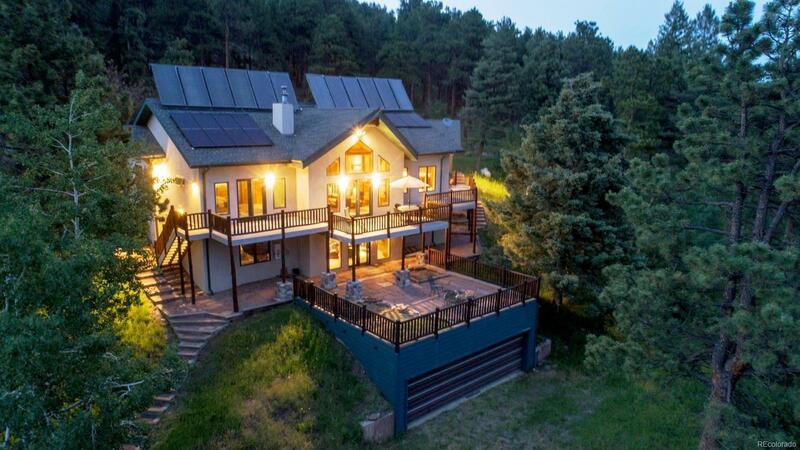 Green built home with solar heating, very energy efficient, very open, with vaulted ceilings. Large deck with views of Pikes Peak, large master bath with in floor heating, open and bright kitchen, living room combo, with beautiful log railing, and wood floors. Sunny and bright lower level family room with walk out to large red-stone Patio. This property is fenced for horses. Be sure to go to Virtual Tour for Great pictures and Video of property.